US Sailing will have athletes in all 10 classes and could realistically walk away with two or more medals. After a disappointing 2012 Olympics in Weymouth, where US Sailing came away without a single medal, a new line-up for US Sailing Team Sperry is set to compete in Rio de Janeiro. As the August 8 start date of the 2016 Olympic regatta approaches, the team features a few proven competitors and lots of fresh talent across the 10 classes of boat competing for medals. But it's worth bearing in mind that although the British team has topped the medals board for the past few Olympic editions, it's Team USA that tops the all-time sailing medals board (although the UK has the greater number of Gold medals). Women’s 470 team Annie Haeger and Brianna Provancha lead an international fleet of 470 dinghies flying spinnakers downwind. Photo: Will Ricketson. In the final months of training, many of the sailors were still looking for that extra gear to get them onto the podium, and a few teams had not made it to the final medal race (top 10 only) at a major international regatta. 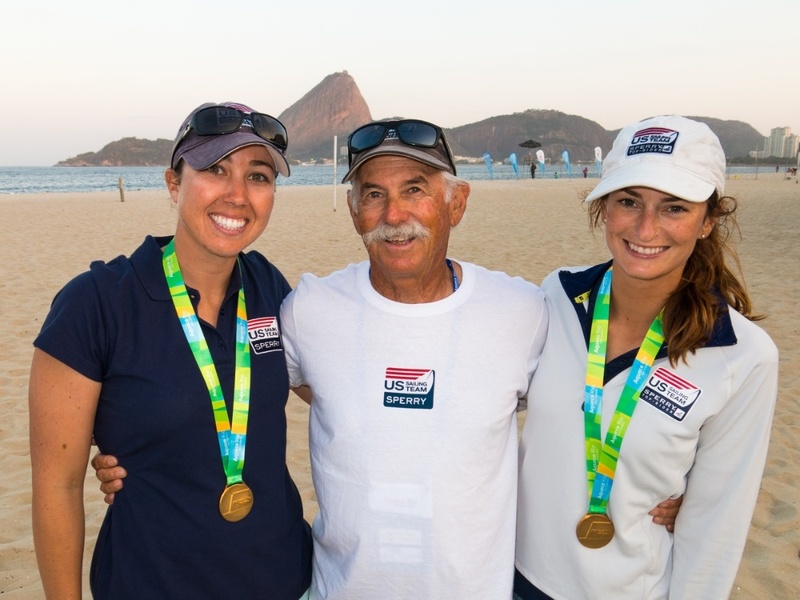 The Team USA program for the period was focused largely on sailing in Rio under the direction of two-time Olympic medalist and High Performance Director Charlie McKee. Even before the final training session, the team had realistic medal aspirations in three classes and the potential to contend in several others. Following is our introduction of the team and an assessment of their chances next month in Rio. 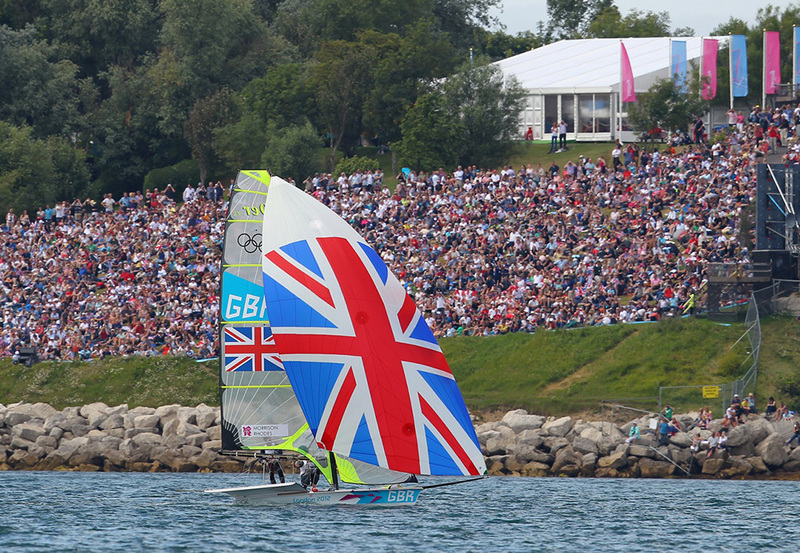 For background on the sailing event, including a description of the 10 different medal events, read our Olympic Sailing Guide. 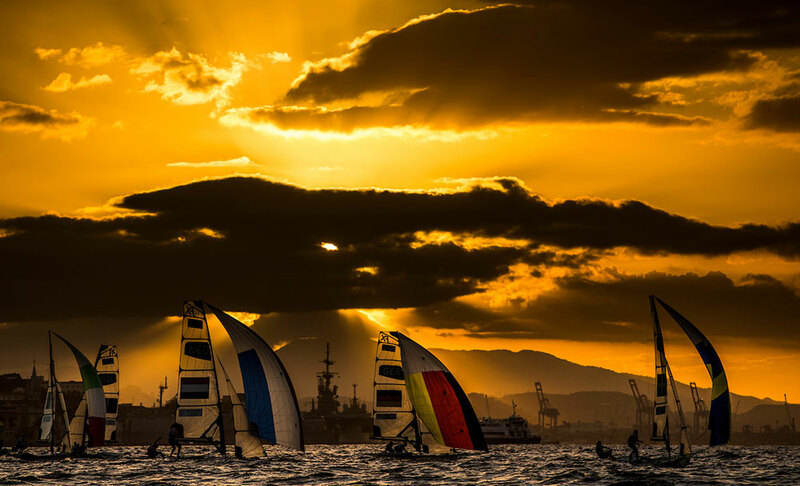 To learn about the intricacies of an Olympic sailboat race, check out our viewer’s guide A guide to watching Olympic Sailing at Rio. Each of the first three teams in our guide is no stranger to the podium at major international events, and in the last year each has finished first or second at a World or European championship or won gold at the Rio Test event last summer. 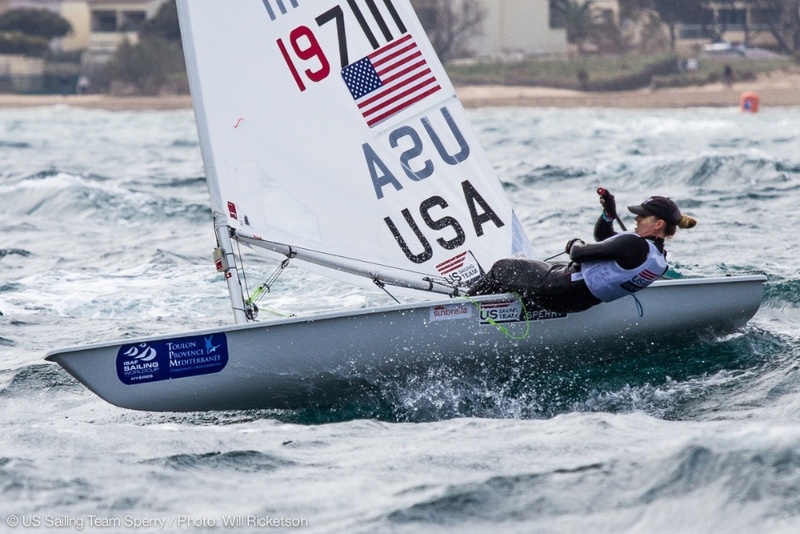 Sailing the Laser Radial, Paige Railey finished second in the recent World Championship. Photo: Will Ricketson. 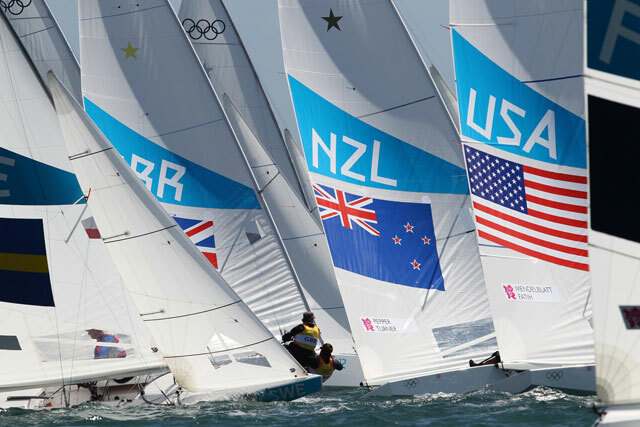 Laser Radial – Paige Railey is a hugely experienced past world champion racing at her second Olympics. She expected to contend for a 2012 medal, but finished a disappointing 8th. Then in August 2014, her training was dramatically disrupted by a severe bicycle accident in which she suffered fractures in her spine, nerve damage, and cuts and lacerations required 50 stitches. In the two years since, however, she has recovered form, and finished second last spring at the Laser Radial World Championship to Alison Young of the UK. Clearly, if Railey is on her game, she’ll be on the podium in Rio. 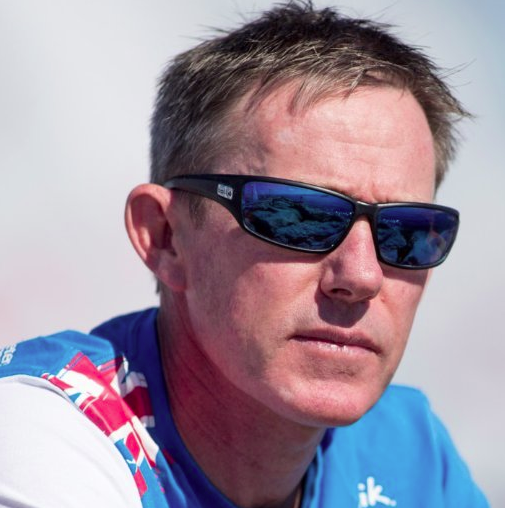 Men’s 470 – The U.S. team’s most experienced Olympian is 470 skipper Stu Mcnay, racing in his third Games and sailing for the first time with Dave Hughes, who has been racing 470s since 2004 and coached the 49er team at the 2012 Games. The pair has compiled an impressive list of podium finishes at many of the world’s toughest dinghy regattas since January 2013. They won the 2015 470 European Championship and scored a fifth and 12th at the last two 470 world championships. In the spring of 2016, they have been in strong form, finishing second, third, and fifth at a series of major spring regattas in Europe, and in Rio in May and July, they won two informal regattas staged by the coaches of Olympic 470 teams. Brianna Provancha (left) and Annie Haeger will compete in the 470 Women’s event; shown with their coach Dave Ullman (a three-time 470 world champ). Photo: Will Ricketson. Women’s 470 – Ranked 7th in the world among 470 women, Annie Haeger and Brianna Provancha will earn a medal in Brazil if they sail their best. They have conducted a strong four-year campaign and have rarely missed qualifying in the top 10 for the medal race at a major regatta. They won last year’s Olympic Test Event on the Rio racecourses, finished third and fourth at the last two 470 European championships, and were 6th at the 470 Worlds last winter. Outside of the first three teams, the US will take to Brazil both experienced singlehanded competitors and a contingent of mostly younger sailors making rapid progress. For any to medal will require another jump or in some case a couple of jumps forward in performance, but in the relatively small fleets at the Olympic Games, such advances have often been made in the past. 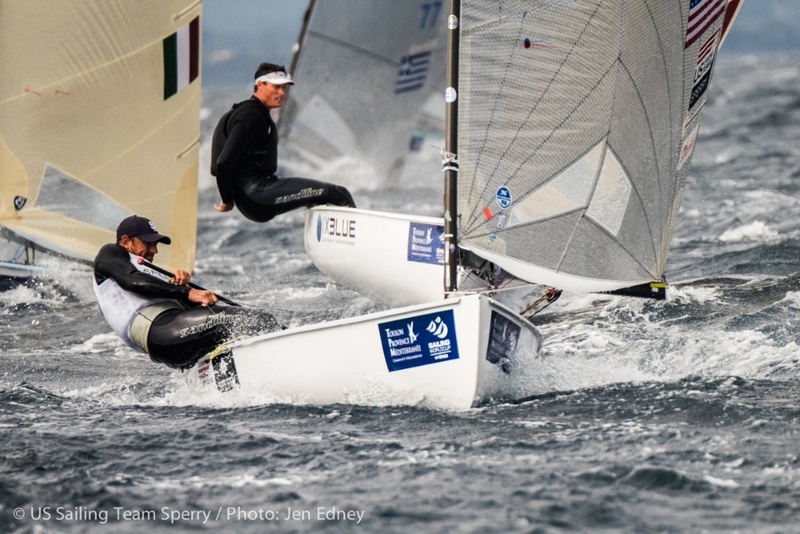 Sailing the Finn and the Laser, respectively, Caleb Paine and Charlie Buckingham are US champions who have proven they can make the top 10 and race for medals in the final race at major international events, but they’ll each need a breakthrough to finish on the podium. Bora Gulari and Louisa Chafee are a new team, improving very fast, and likewise, Paris Henken and Helena Scutt have made strong advances since the first of the year and could pull off a surprise. San Diego sailor Caleb Paine will represent the US in the Finn Dinghy, an extremely powerful, physical boat to sail. Photo: Jen Edney. Finn – Caleb Paine has been the top-ranked American Finn sailor since 2012. To qualify for his first Olympics, he had to win a come-from-behind match against 2008 silver medalist and former training partner Zach Railey, who came out of retirement and pushed Paine to the final race. 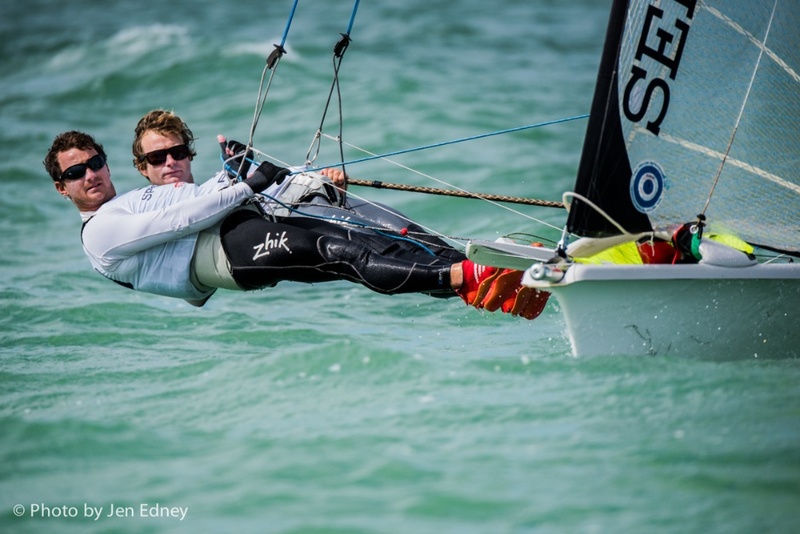 Paine is a top-10 contender in his class, currently ranked 9th among Finn sailors by World Sailing. Charlie Buckingham will race for the US in the Laser, the most popular racing class in the world. Photo: Will Ricketson. Laser – Charlie Buckingham earned College Sailor of the Year honors twice in his career at Georgetown University and won the 2014 Laser North American Championship. 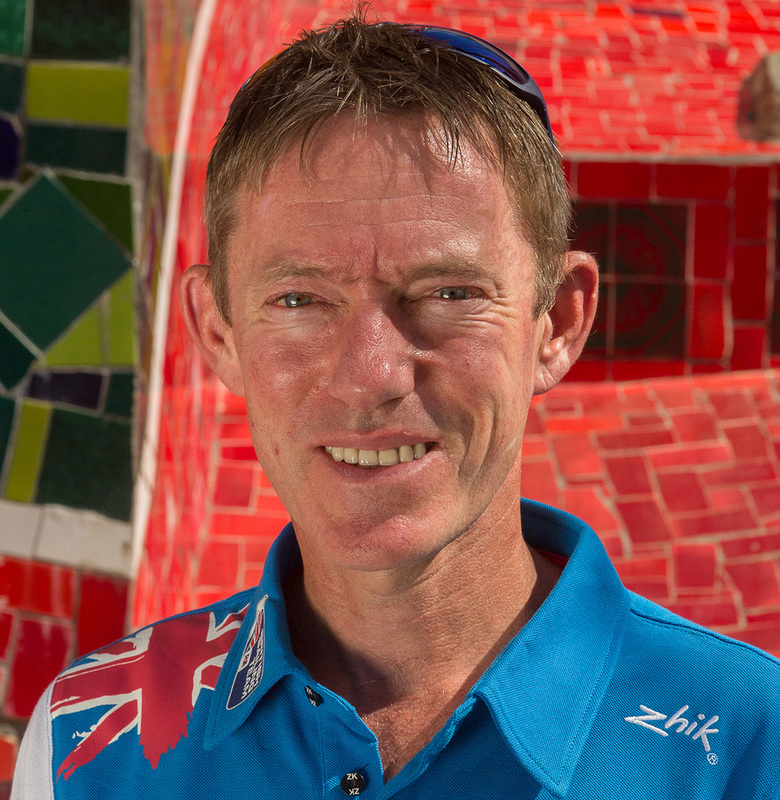 In larger fleets, such as the last two Laser Worlds, he has often finished outside the top 10, but at the 2014 and 2015 Olympic test events in Rio, Buckingham made it to the medal race and earned 7th-place finishes each time. 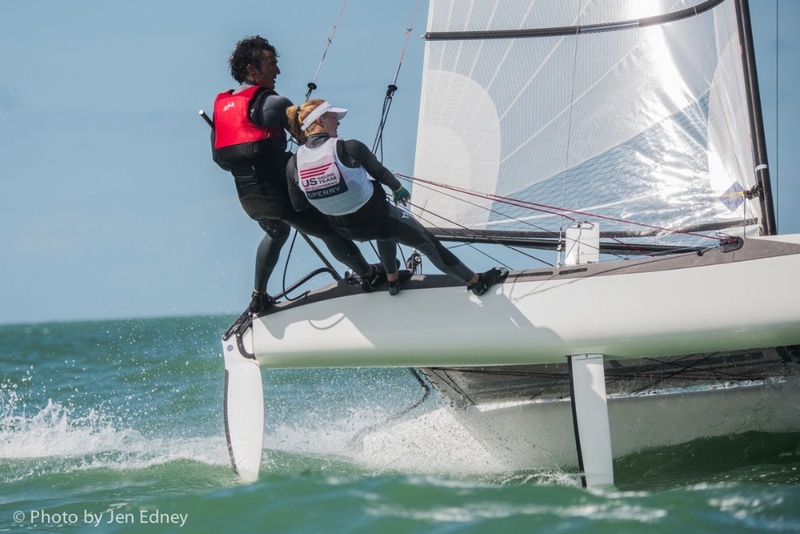 Catamarans return to the Olympics this year with a mixed-crew requirement and a new design, the Nacra 17; Bora Gulari and Louisa Chafee will represent the U.S. Photo Jen Edney. Nacra 17 – Bora Gulari and Louisa Chafee are an unusual pair of sailors in this first-time mixed-gender event at the Olympic Sailing event. Gulari is an experienced professional sailor and all-around “speed merchant,” who has twice won world titles aboard Moth Class foiling dinghies. Chafee graduated from Brown University in 2014 as an All-America Team crew and began racing Nacra 17s. 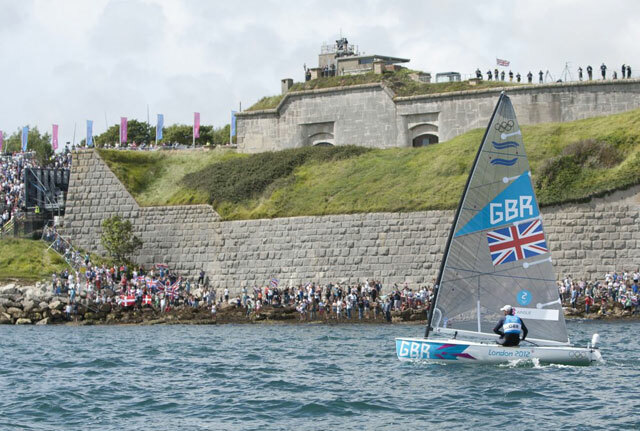 The pair started sailing together less than a year ago and would have to be rated dark-horse contenders, yet they have improved quickly and just two months before the Games, broke through at the Sailing World Cup in the UK and qualified for the medal race, finishing seventh. 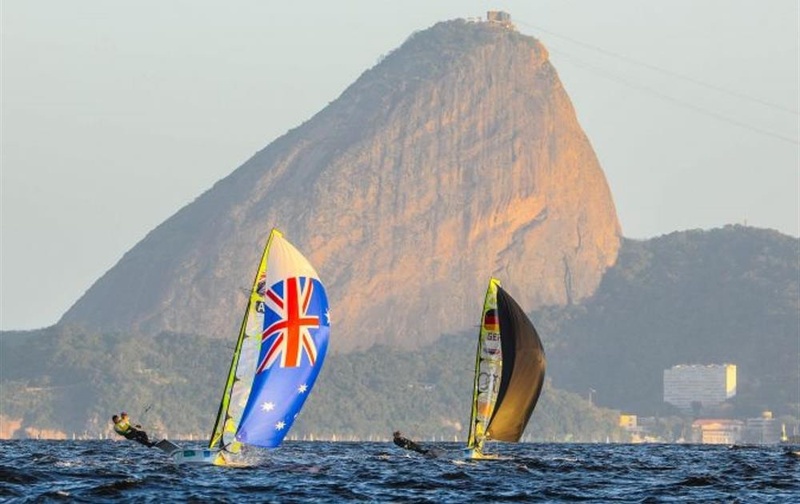 This is the first Olympic Games in which a women’s skiff dinghy, the 49erFX, will be utilised. Paris Henken and Helena Scutt will compete for the U.S. in the extremely lightweight class. Photo: Will Ricketson. 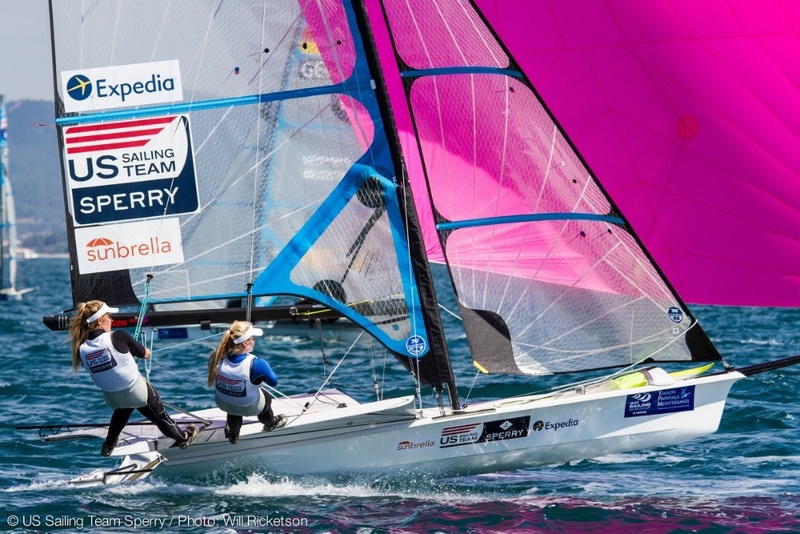 49erFX – West Coast sailors Paris Henken and Helena Scutt began sailing the new women’s skiff dinghy class in 2013. They won a bronze medal at the 2015 Pan American Games and finished 13th at the 49erFX Worlds last February. 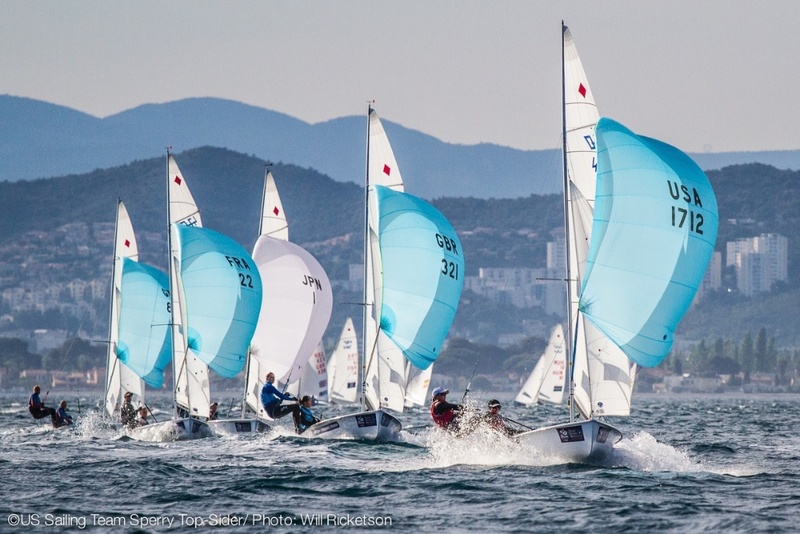 A month later, they qualified for the medal race at the Trofeo SAR Princesa Sofia and earned an 8th for the regatta, then finished 13th at the European Championship. 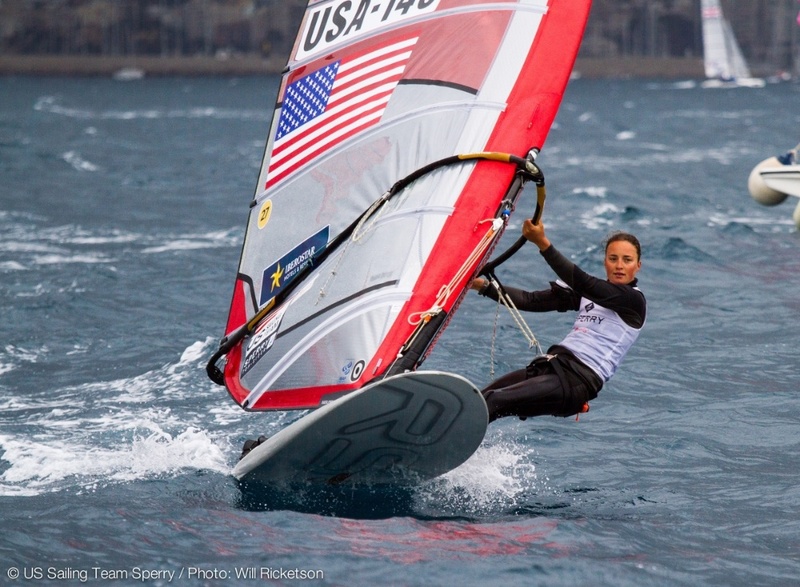 Stanford undergraduate Marion Lepert will carry the U.S. flag on the sail of her RS:X windsurfer. Photo: Will Ricketson. Women’s RS:X – In the women’s windsurfing event, Marion Lepert took leave from her Stanford University undergraduate studies and campaigned successfully for US selection over 2012 Olympian Farrah Hall. She won a bronze medal at the Pan American Games in Toronto in 2015 and currently ranks 25th in the world. 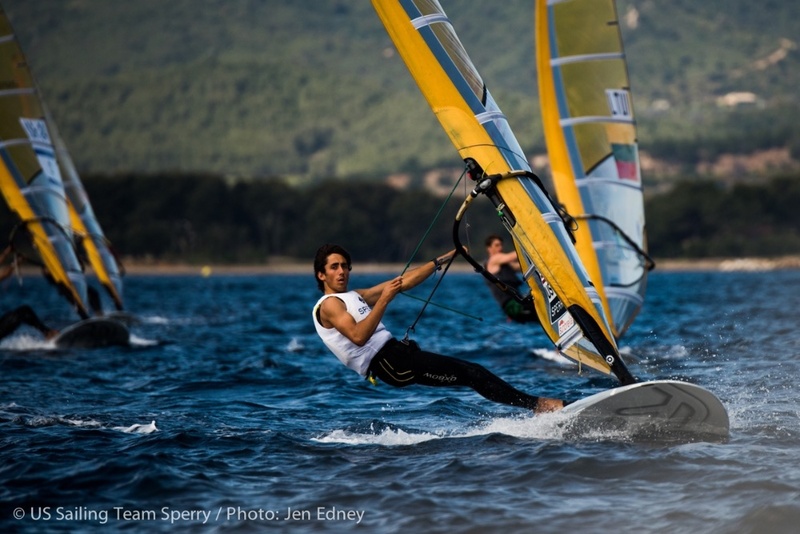 Lepert continues to improve, and her best finish at a major international event was inside the top 10 at the Trofeo Princesa Sofia last spring where she also finished first in the medal race. 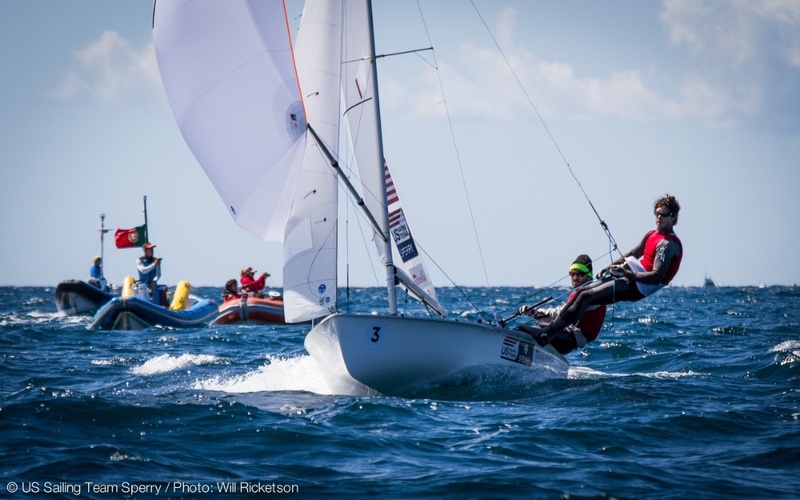 49er – Thomas Barrows and Joe Morris were the clear winners of the US selection process in the men’s skiff dinghy class, based on finishing 13th at the Sailing World Cup Miami and 23rd at the 49er Worlds a month later. The team has yet to crack the top 10 at a major event, but keeps getting closer and would certainly have finished higher at the Worlds if they hadn’t needed to focus on the other US contenders. The two sailors met on the Yale University team on which both were champion skippers, and in 2012, they joined forces on the 49er to campaign for the Olympics. For Barrows, this will be a second shot at the Olympic podium; in 2008, he raced in the Laser class as a representative of the US Virgin Islands. Men’s RS:X – Pedro Pascual won the 2015 RS:ONE European Championship, then qualified for the gold fleet at the 2016 RS:X Worlds. Pascual, an undergraduate at Florida Atlantic University, finished the World Championship in 34th and finished two other major spring regattas in Europe in similar position. A year ago, Pascual was not ranked in the top 100 in the class and as of June 2016, ranked 32nd. 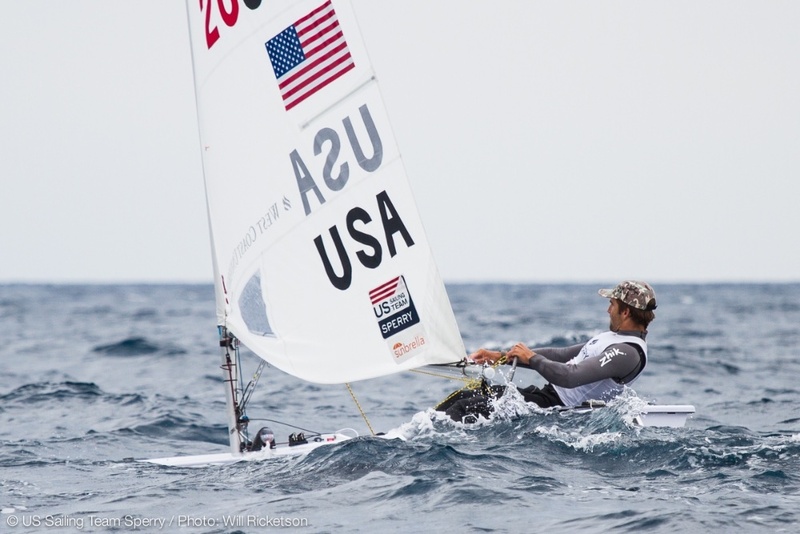 At age 19, he is the youngest member of the US Olympic Sailing Team. For much more on the U.S. Olympic Sailing Team, plus the U.S. Paralympic Sailing Team, watch the hour-long Uncharted Waters documentary produced by Sunbrella, one of the team sponsors.